These two teenage brothers and their sister were from Lyon, and all three started working with the Lumière Cinématographe in 1896. Lucie's seems to have been the least significant role (except that she is probably the world's first camerawoman), taking occasional views in the Lyon region in 1896, whereas the brothers were sent further afield for longer assignments. 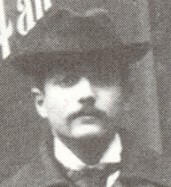 Pierre (pictured) went to Italy in June 1896, showing films in Milan, Turin and Venice in collaboration with the Lumière concessionaries Vittorio Calcina and Genty, and also filming scenes including the wedding celebrations of the Prince of Naples and the Princess of Montenegro. He returned to Lyon at the beginning of 1897. Of the three Chapuis siblings, Marius had the most daunting task, travelling to Russia in May 1896 and staying there for almost a year and a half. The standard Lumière practice was to send a Cinématographe to a territory with two operators who were suprvised by the local concessionary, and Marius Chapuis first worked with an operator called Curtillet until the latter returned to France due to illness, and then with Paul Decorps (the name of Cerf is also mentioned). The concessionaries in Russia were the Grunwald brothers, with Arthur Grunwald taking the prominent role. Marius and his colleagues travelled to towns and cities all over the Russian empire, including Odessa, St. Petersburg, Kiev and Tiflis, and showed films to audiences who were usually seeing them for the first time. The Chapuises seem to have been a close-knit family, and part of the reason that we know as much as we do about their activities (in contrast to several other Lumière operators) is the voluminous correspondence that they exchanged in this period and which has been preserved.